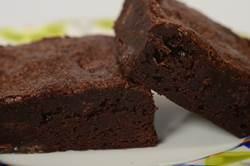 A brownie that is cake-like with a deep chocolate flavor yet is wonderfully moist and chewy. Pour into the prepared pan and smooth the top. Bake for about 28 - 30 minutes, or until a toothpick inserted into the center has moist crumbs clinging to it. Remove from oven and place on a wire rack to cool to room temperature. Then, to make the brownies easier to cut, cover and place in the refrigerator for two hours or until firm. When ready to cut the brownies, lift the aluminum foil out of the pan and, with a sharp knife, cut the brownies.